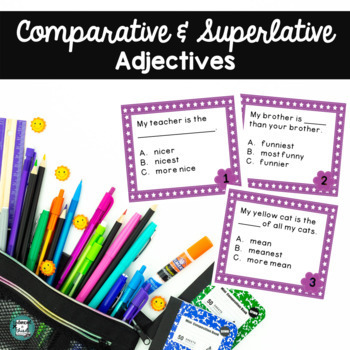 This is a great way to practice CCSS with your students!!! 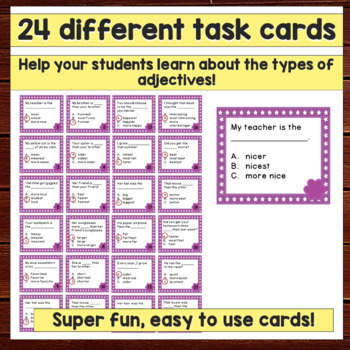 These task cards focus on adjectives with a fun theme in which students are asked to complete a sentence with the correct adjective to get the right answer. This is a fun way to get students to practice a skill that is more abstract. An answer key is also included with answers for all of the task cards. 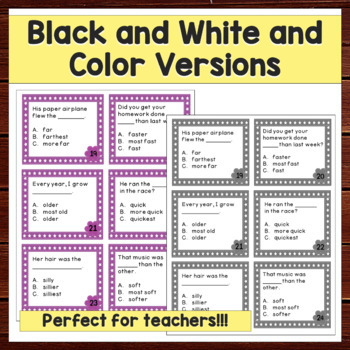 You can use these as assessments (a great formative or summative assessment, with the ability to differentiate and give as many or little as you want), in centers, to play Scoot, or as independent work, etc. •	Please go to your My Purchases page (you may need to login). Beside each purchase you'll see a Provide Feedback button. Simply click it and you will be taken to a page where you can give a quick rating and leave a short comment for the product. Each time you give feedback, TPT gives you feedback credits that you use to lower the cost of your future purchases. 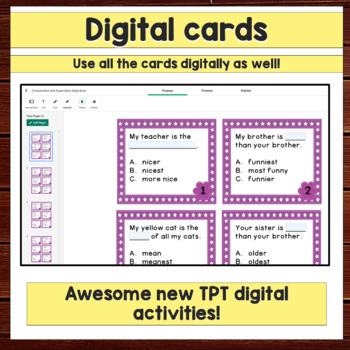 I appreciate your feedback as it helps me determine how to improve each of my products and ensure that they are valuable for your classroom.